The following are excerpts from from "Kids Closer Up: Playing, Learning, and Growing with Digital Media" by Lori Takeuchi, International Journal of Learning and Media, Spring 2011, Vol. 3, No. 2, Pages 37-59. To protect the children's identities, all names are pseudonyms, and location details have been altered. While large-scale surveys have documented the types of media to which 5–9-year-olds are devoting increasing amounts of time, we know less about how and why they are using these media and what they might be learning as a result. This research provides rich details on the processes, relationships, and contexts that larger scale studies on children’s media use cannot by examining two 8-year-old girls’ engagement with video games, the Web, mobile devices, and other emerging technologies against the backdrop of family life. What roles are parents and others playing in their digital media experiences? And how is their engagement with digital media related to family values, relationships with peers and siblings, and what they are doing at school? The case studies illustrate how young children’s access to and interest in technology are shaped by cultural, institutional, interpersonal, and developmental forces and, in turn, how access and interest shape individual learning. Parents are either alarmed or excited by what the Internet, video games, and cell phones can do to—or for—their children. The telephone, radio, and television evoked similar sentiments among previous generations of parents, but some assert that today’s technologies are fundamentally transforming the way children play, think, and learn. Journalists and scholars alike say that digital media support creative expression and peer collaboration; foster technical troubleshooting and computational thinking; and inspire civic engagement, global awareness, and environmental stewardship. As a result, today’s “digital natives” and members of the “Net Generation” are, according to authors like Marc Prensky and Don Tapscott, more innovative, more enterprising, and more fluent with information technologies than the generations before them. Researchers Amanda Lenhart and Mary Madden have confirmed these disparities empirically, finding that of all U.S. 12-17-year-olds who go online, only 57% have built a blog or Web page; posted original art, photos, stories, or videos; and/or remixed online content. This figure hardly reflects an entire generation of technology-savvy individuals. Chad is philosophically opposed to censoring media and trusts Katie to make smart choices on her own. Recent ethnographic work has begun to paint a more complex picture of the digital lives of American youth. The multi-institution Digital Youth Project, the most extensive ethnographic study of youth media use in the United States to date, sought the perspectives of an economically diverse set of 12–18-year-olds on what they are playing, communicating, and creating with new media, endeavoring to understand how these practices are embedded in the broader social and cultural ecology. What they discovered is that teens are using online media to extend real world relationships, explore interests, express identities, and expand their independence and that they are practicing new technical and social skills along the way. Contrary to the digital natives argument, however, fewer youth use new media in “interest-driven” practices to acquire information or cultivate skills beyond what is available to them at school or in their local communities. A minority of youth are “messing around”—experimenting with new tools and developing technical skills along the way. Even fewer are “geeking out” by participating in online communities to improve their craft and gain the respect of online peers. The current work employs in-depth case studies of two 8-year-old girls to illustrate how young children’s access to and interest in technology are shaped by cultural, institutional, interpersonal, and developmental forces and, in turn, how access and interest shape individual learning. This proposition, if true, would suggest that children experience digital media differently from the get-go and that trajectories of learning with digital media diverge from a young age. Along this line of reasoning, digital natives are made, not born. Findings from the current set of case studies build upon these and other fine-grained studies of young children’s digital media use and learning, bringing to bear the particularities of the era, locale, and culture of the two individuals I studied to refine our collective and ever-evolving portrait of the 21st-century child. Eight-year-old Victoria Sarkissian is the youngest child in a family of six. Her three much older siblings -- ages 17, 20, and 21 -- gave her parents practice raising children in a digital age before Victoria began to express her own interests in iPods, the Internet, and video games. Victoria's parents Karen and Ara Sarkissian are in their late 40s, own a lovely house in an affluent neighborhood of a suburb of Los Angeles, and can afford to purchase the technologies they consider necessary for the learning, communication, and entertainment needs of their family. Katie Yamato is also eight and an only child. She is "hapa," a Japanese term for half Japanese, half something else, which in her case is Mexican. By court order, Katie stays Wednesday nights and every other weekend at her grandparents' house, where her father Chad (age 30) and stepmother Aileen (age 25) also live while Chad works on his associate's degree. Katie spends the rest of the time with her mother, Janea Perez (27), in an affordable housing complex located about three miles away. Katie's parents are members of the 'Net Generation, and grew up on video games and surfing the Internet. Katie said she plays online games about once a week, when she is at her dad’s house. She rarely plays at her mom’s house, “’Cause she’s always on the computer. She makes a lot of music. So she makes music like every day.” Since her best friend, Victoria, began alerting Katie, a year or so ago, to the fun to be found at GirlsGoGames.com, MyScene.com, and the Disney Channel Web site, Katie has taken an interest in the Internet. Katie goes online by herself about half the time. She asks for either Chad’s or Aileen’s permission, and they set her up by turning the computer on and logging her in before leaving her in the back office to pick up whatever they were doing before the request. Katie enjoys beauty and fashion games most, which may have something to do with her mom being the manager of a beauty supply store and a newly licensed aesthetician. But Katie also states a fondness for any game that allows her to “be creative.” Katie said she can spend hours alone painting nails and designing outfits online but prefers drawing pictures on real paper using the real crayons, paints, and pens she has stashed at her dad’s house. Taking out and putting away the art supplies may be a bigger pain than just launching a Web site, but with the real pictures she makes, “I don’t have to throw it away.” Several pieces of her art are posted on the walls of her dad’s house. For the most part, Victoria sets her own learning goals and pulls in her parents and older siblings to help her achieve these goals in a just-in-time—rather than planned-out—fashion. She is comfortable enough to figure out new tools and software on her own, but her father and especially Henry still help her get started. With Paint, for instance, “My dad and my brother had to show me how to get on there and sometimes they watched me to see that I didn’t mess anything up.” Unlike Katie, who only visits (or cares to visit) GirlsGoGames.com, MyScene.com, and the Disney Channel, Victoria surfs the Web for information about fashion design (e.g., the Project Runway site on Bravo network’s website), the breed of miniature rabbits she keeps as pets, and anything else that strikes her fancy. Well, almost anything. For the most part, Janet and Ara trust Victoria’s judgment, but they did express concern about her online privacy and safety: “We’ve had the discussion that you only talk online with people that you know. Because anybody can say that they’re an 8-year-old boy.” This is why Janet and Ara set up the parental controls feature on the desktop so that Victoria can access her favorite Internet haunts—e.g., Webkinz, Club Penguin, YouTube, and Google—but the system blocks her from any unrecognized Web sites. Victoria has to ask either her father or Henry to type in the password if they approve of the site. With this setup, Victoria can only really surf the Web if one of them is around, and in this way the adults in the house are always aware of the Web sites she is visiting. Janet said she feels no need to restrict her 8-year-old’s time on the computer, playing video games, or even watching TV, because Victoria’s routine and other factors—such as having to share the PC with her brother—naturally limit the frequency and duration of these sessions. When Victoria gets home from school, she has to finish her homework before she can do anything else, technology related or not. And throughout the week she has plenty of non-tech activities to keep her occupied, such as soccer and volleyball, cleaning the bunny cages, play dates with friends, and visiting relatives near and far. Consequently, Victoria’s lifestyle is relatively balanced: “She gets her exercise. She gets her homework done. She, you know, she’s got a wide variety of interests.” Besides, Janet added, “After four kids, you kind of, you know, lessen up on restrictions, I mean, from everything.” As parents they have learned their lessons over the years, including what is worth the effort and what is not. While Katie may not have access to the platforms and software that Victoria’s more affluent parents can afford, she is allowed to visit and view content that Victoria cannot. Chad is philosophically opposed to censoring media and trusts Katie to make smart choices on her own. The Sarkissians, on the other hand, are more vigilant about Victoria’s media consumption, with parent controls set on the computer and siblings around to keep an eye on what she is doing. Past research has associated higher levels of parental mediation with higher family income and parent age, findings that are consistent with what I observed in the Sarkissian (higher SES) and Yamato (younger parent) households. Despite differing mediation styles, neither Katie’s nor Victoria’s parents believe their girls are overdosing on media. Katie and Victoria still enjoy playing outside, so their parents have not yet felt a need to peel them away from the TV or computer to get fresh air or exercise. But the case study parents may also be unaware of just how much media their daughters consume on a daily basis, because MP3 players and the Nintendo DS tend to be used in the outer reaches of the home, where parents cannot always see what their children are doing or for how long. 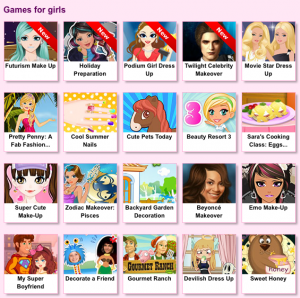 In the next post, Lori Takeuchi examines how the girls use digital media to develop their identities.